The charm of Norwich is perhaps its rich history and heritage with a plentiful mix of world culture thrown in. 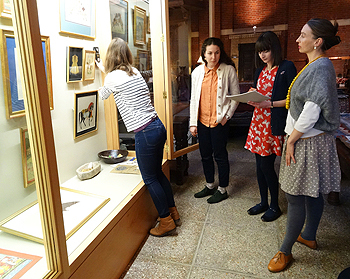 South Asian Decorative Arts and Crafts Collection Trust (SADACC) nestled in the Norwich city centre is one of the firmly established art organizations that paint Norwich as one of England’s finest cultural cities. SADACC, founded in July 2010 by Philip and Jeannie Millward as a charity and become affiliated in 2012 to the University of East Anglia through the Sainsbury Institute for Art (SIfA), is an organization dedicated to conserving and promoting an interest in the arts, crafts and culture of South Asia and neighbouring regions. In tandem with its commercial partner, Country and Eastern, also set up by the Millwards some 30 years ago, the Trust showcases some of the best traditional and vernacular craft items of these regions in a restored Victorian roller skating rink. The Trust also holds exhibitions, lectures and related events. Its own collection focuses on the everyday and comprises over 4000 objects from South Asia and its surroundings, including Afghanistan, Burma, Thailand and Indonesia. These include paintings, prints, textiles, furniture and much more. 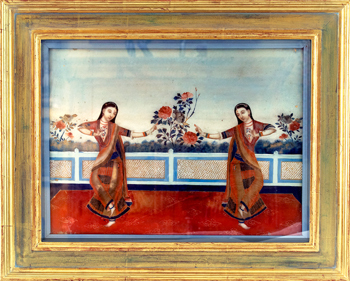 The collection resulted from a number of trips through South Asia in the 1970s by the proprietor, and fine items brought back by European artists who travelled through the region during the late 18th to early 20th century being added from the 1980s onwards. In 2011, a new gallery was set up to display vernacular furniture and textile hangings with larger architectural items on permanent display throughout the vast building. Furthermore, there is a separate exhibition space dedicated to themed exhibitions staged every few months. For those unable to visit the galleries, its collection catalogue can be accessed through their website (see link at the end of the article). For those closer by, SADACC hosts a range of lectures and events for the public that are well worth attending. In particular, The Future of South Asia Collections: UK and South Asian Perspectives conference that was held 30 April to 2 May 2014 was a stimulating event. The three-day conference celebrated the affiliation of the SADACC Trust with the Sainsbury Institute for Art (SIfA) at the University of East Anglia. The conference explored the notions of ‘craft’ and ‘world art’ across the SIfA institutions, one of which is the Sainsbury Institute for the Study of Japanese Arts and Cultures.The conference brought together specialists who discussed the interrelation of form, function, material, process and meaning in craft practice, and how they are mediated through social, economic and cultural influences. These discussions highlighted the skill and craftsmanship involved in the making of decorative art objects including those in the South Asian Decorative Arts and Craft Collection and placed them in national and international context. The conference was a rare opportunity to hear from some of the most distinguished scholars and specialists working in the field. The conference was one of the many fruitions of a long-standing relationship the Millwards have cultivated with the University of East Anglia. Dr Millward shared his delight on the affiliation: ‘We have worked with the UEA on an ad hoc basis for many years and this will formalize the relationship.’ The first major project was a four-month assessment of the Trust’s collection by the University which took place in 2011. 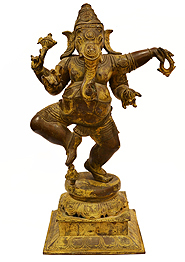 The survey revealed that the Trust’s collection was particularly unique for its vernacular furniture and architectural items when compared to similar collections of textiles, ethnographic items, paintings and prints, and metalwork in the UK, Europe and South Asia. Future collaborative plans include an upgrade of support facilities for public and academic events held in the building and staging exhibitions based on the collection. Associated research and educational activities are also planned. The Millwards are actively working to make SADACC objects available as an educational resource. The affiliation with SIfA will certainly help secure a long-term future for the collection and the iconic building, with public access guaranteed. To encourage research, the Trust has a small but comprehensive library. Although the entire collection is catalogued in hardcopy, new acquisitions and existing ones are being transferred onto an AdLib Museum Lite database. In this light the Trust is also working to nurture the next generation of academic stars. It offers annual scholarships and grants for postgraduate study on the decorative arts, crafts and culture of South Asia. For those interested in learning about the collection without necessarily carving out an academic career path, the Trust offers tours and talks arranged with advance notice. The helpful guide can cover the collection or the history of the building, including its construction and use as a skating rink, and its subsequent use as a Vaudeville theatre and its association with General Booth and the Salvation Army. Professor John Mack, Chairman of SIfA and Trustee of the SADACC Trust, emphasizes the importance of cultivating and celebrating diversity in the arts. John welcomes the Trust as ‘generous local patrons [who] have so willingly encouraged an expansion in the range of activities and educational opportunities.’ With a constellation of organizations focusing on the arts from practically all parts of the globe, Norwich is set to continue shining as a city of world culture.